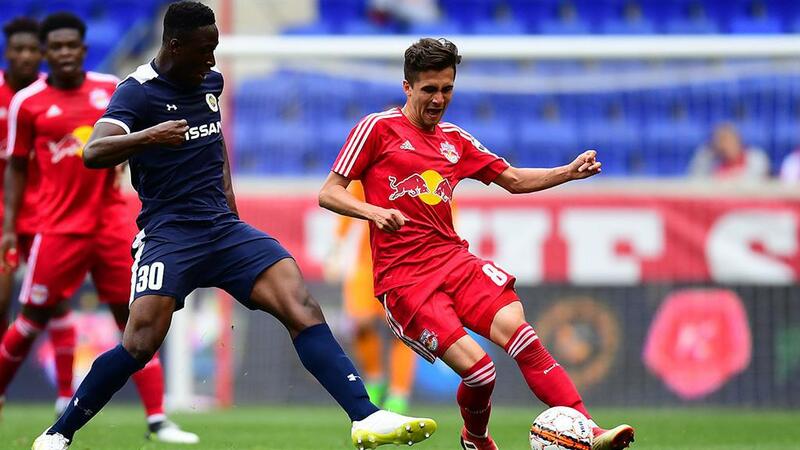 HARRISON, N.J. – Both sides had chances to grab victory late, but the New York Red Bulls II and Nashville SC played to a 1-1 draw on Sunday afternoon at Red Bull Arena in a thrilling contest. Nashville took the lead in the seventh minute as Ropapa Mensah stole possession from New York’s Jordan Scarlett on the back line and moved in for a low finish, but the Red Bulls II began to take more control as the first half went on and a perfect pass by Chris Lema put in Vincent Bezecourt for a low finish to the left corner in the 27th minute. New York almost took the lead late in the first half as a clever piece of footwork by Cristian Casseres Jr. bought him space, only for his lifted finish past advancing Nashville goalkeeper Matt Pickens to slide just wide of the left post, while Mensah was denied just past the hour mark as Red Bulls II goalkeeper Evan Louro made a fine save to deny his header just past the hour-mark. New York’s Amando Moreno almost made a quick impact off the bench, being forced wide by Pickens as he got in behind the Nashville defense that made the angle for his attempted finish to narrow, but as the game opened up in the final 15 minutes both teams had chances to take the lead. Nashville’s Lebo Moloto went close in the 80th minute, slipping nicely past his marker only to send his finish into the left side-netting, while Jared Stroud’s finish for New York was blocked by prone teammate Brian White after the forward had slipped after challenging for a cross with five minutes to go. The hosts needed a big clearance off the line by Hassan Ndam in the 88th minute to keep out Moloto with Louro stranded, while Louro made a big save to keep out a header by Bolu Akinyode in stoppage time, but the last chance fell to New York to grab a dramatic win as a shot by Brian White flew high as the game ended level. 1. New York finished level for a fourth consecutive outing, ending its perfect record at Red Bull Arena after a contest where the hosts once again did plenty right but couldn’t quite find the final finish to put the game away inside the opening hour. Narrowly missed chances that fell to Cristian Casseres Jr. and Vincent Bezecourt late in the first half – both of which would have been highlight-reel finishes had they landed – were the story of the game for the Red Bulls II as they returned home after their recent road trip. 2. Nashville had to work to create chances, particularly in the first half as New York set the tempo for much of the opening 45 minutes, but the disruptive play of Ropapa Mensah in attack not only earned the visitors the opening goal of the game but also put a spotlight on the young Ghanaian as he continued to lead NSC’s line effectively. After starring for Penn FC a season ago, many around the USL knew what Mensah was capable of in Nashville, and his performance on Sunday should have turned more heads around the league as to the danger he poses. 3. Both sides could feel they should have found a decisive goal in the final 20 minutes as chance after chance presented itself to both sides. Nashville in particular could feel it should have stolen three points on the road with a late flurry of opportunities, the best of which saw Lebo Moloto be maybe a little to casual with his finish which allowed Red Bulls II defender Hassan Ndam to make a goal-line clearance. The energy produced in attack by both sides made the ending a thrilling one, and the rematch late in the season one that should be a must-see for neutral fans. Chris Lema, New York Red Bulls II – Lema picked out a sensational pass to set up New York’s equalizer, but was also strong at both ends of the field, winning 9 of 15 duels, six tackles and recording two key passes.